This is the painting I have been working on for quite a while. Most of the time was spent on drawing the floral fabric in the background. I began by thinking I could do my normal procedure of painting and drawing at the same time until I realised I would go cross-eyed and lost doing this. As I started drawing the flowers I considered the fabric I had placed the figurine on, a green fabric, it just didn’t seem right. Searching through my fabric stash I came across this old favourite. It was a remnant from a duvet cover I had made for one of the kids years ago. At the moment, I am considering this finished as I found I was fiddling with it and I know once I get to that stage, I will not improve what I have. I might go back to it later, once I have had time to absorb it. Now it time to go onto the next project. I think I am beginning to identify which direction I am going. I am going to continue to do ‘still life’ but it is not going to be fruit in a bowl or flowers. I might include those subjects eventually as fruit in particular is part of my life but not something I particularly relate to. Fabric and pattern will have a strong influence and I seem to prefer single objects to groups of objects although I have a couple of knick knack type things I like to group together. I am not ready to move away from the arranged subject yet but I don’t discount the possibility that I will in the future. This painting is done on a prepared 16×18 canvas, using oil paints. This is also a big change as I have used acrylics since my time at BAA so it was a bit daunting to say the least, but as I was using fairly thin layers of paint, it should be OK. If I continue to use oils, I will need to read up and talk to other artists on how they use them. On the whole I was happy with this still life. Like exercise,(another area of my life that I am trying to improve), the more you do it, the more comfortable you feel with your progress. Per the image, the red is not quite as red as it appears, apart from that it seems from this screen to be fairly accurate. 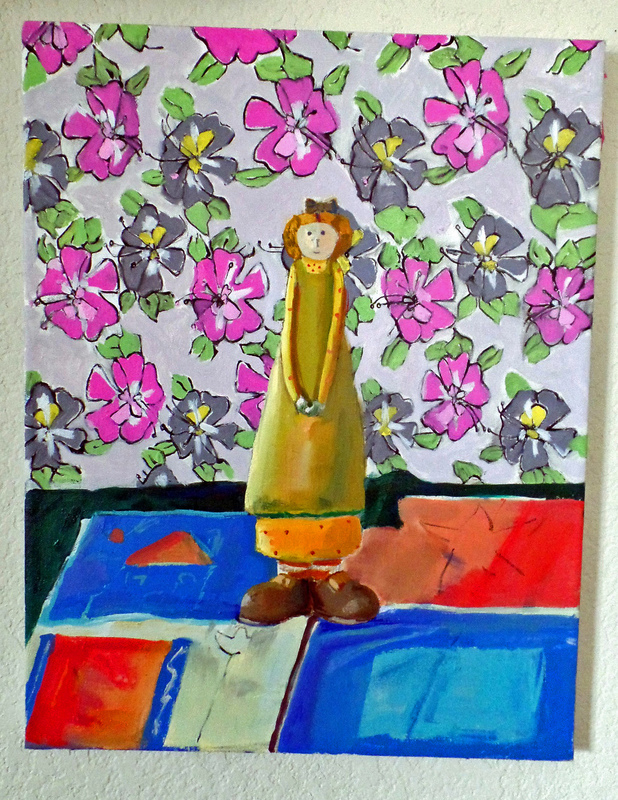 This entry was posted in still life and tagged acrylic paint, BAA, Bath Academy of Art, oil paint, still life. Bookmark the permalink.